2. The tank inside the building, the hot water loses less energy than the normal one . 2. When the temperature of the collector reaches the set value, the controller starts the circulation pump automatically. 4. 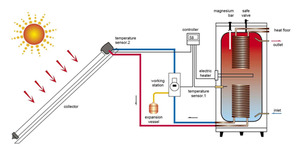 The heat-conducting liquid transfers heat to water by lower heat exchanger in the water tank. Professtional services : 1.Your company information, products desigh or other confidential information 2.All inquiries related to our products will be replied within 24 hours. 3.OEM is acceptable. 4.Well- trained and experienced sales are ready to service you. 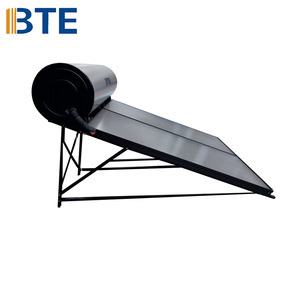 With many years' experiences and Research, BTE team has developed different kinds of solar collectors for different working temperature and circumstance. 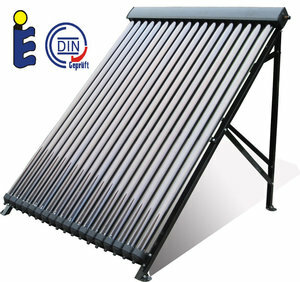 The solar photovoltaic products including solar panels, solar lamps, power generating system and solar pumps. 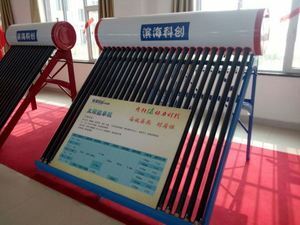 In addition, BTE is the core member of Solar Cooling Equipment Joint Research Center and supply heat collecting design for solar cooling system. Detailed Images Packing & Delivery Packing details. 1 SET HEATER includes 1 frame, 1 200Liters water tank, 20 58*1800 heat pipe vacuum tubes and accessories like circulation pump, electric heater, valves etc. All packed in 4 seperated cartons. 2. When the temperature of the collector reaches the set value, the controller starts the circulation pump automatically. 5. 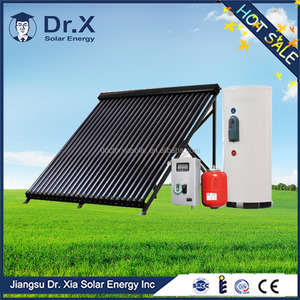 When the temperature difference between solar collector and tank doesn't reach the set value, the circulation pump will be shut automatically . 6. 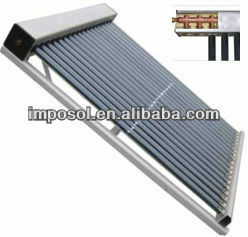 In case the temperature of the water tank does not reach Tmax, Electric Heating Element will start to work automatically. 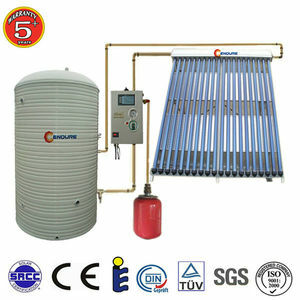 Haining Jinneng Water Heater Co., Ltd.
5.The heat pipe collector, no water going into the tube, no bursting of tubes and it could heat the water at minus 50 degrees. 6. When the temperature of the storage water tank(TR) reaches the preset highest point, the controller turns off the circulating pump. 7.The auxiliary electrical heater of the water tank could maintain the temperature of the water tank at preset point automatically. 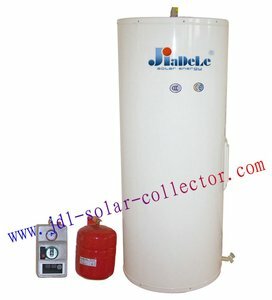 Alibaba.com offers 13,557 split water heater products. About 53% of these are solar water heaters, 1% are electric water heaters, and 1% are industrial heater. A wide variety of split water heater options are available to you, such as ce, cb, and ul. You can also choose from evacuated tube, flat-plate. As well as from freestanding, wall mounted. And whether split water heater is stainless steel, or plastic. 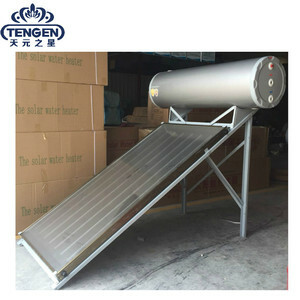 There are 13,290 split water heater suppliers, mainly located in Asia. The top supplying countries are China (Mainland), Australia, and Taiwan, which supply 98%, 1%, and 1% of split water heater respectively. 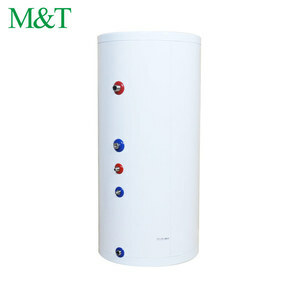 Split water heater products are most popular in Domestic Market, South America, and Western Europe. You can ensure product safety by selecting from certified suppliers, including 10,253 with ISO9001, 5,646 with Other, and 3,162 with ISO14001 certification.